What's that movie called again ? The 1 with this energy emitting thingy implanted in Rober Downey Jr.'s chest ? I created such device yesterday at the gym . 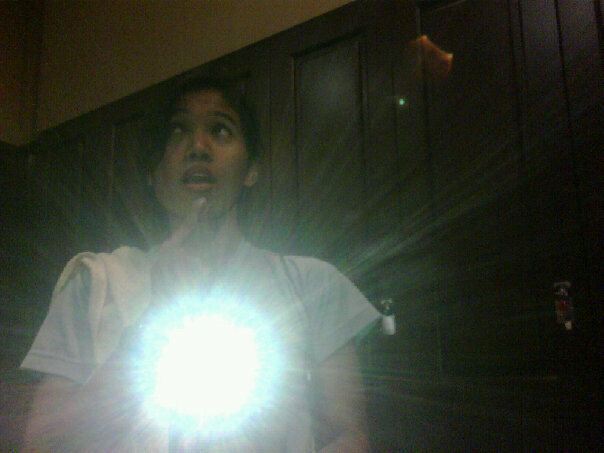 haha.. thanks to the flash from my phone ! your light is bigger and brighter! Jamie, the brighter the better ! hihih..
i also like your facial expression – all that’s missing is the black suit worn by Scarlett Johannsen (spelling silap sikit). Ijam. Ironlady ? can also la.. but i dont have the suit like downey jr. ! giler smart ! The Arc Reactor- power source for his battle suit……. but you do not need all that sebab you already Ironman what! Ironman can’t survive without it !! Hihihi 🙂 Paul, come join me n some friends for a ride tmrw night ! But we’re slow la ok..! Aiyyaah! By the time I got back and read this sudah pukul 8.30 malam lah…. lepas ni got to fetch my son from his class masak-masak. My name is Alia, I am Azwar’s (pipot) sister. Stumbled upon your blog by chance. I appreciate if you can e-mail me at the above address, I think I need your help with a few things. Thanks in advance.